Thucydides (c. 460 B.C.E. - c. 400 B.C.E. ), Greek Θουκυδίδης, Thoukudídēs) was an ancient Greek historian, and the author of the History of the Peloponnesian War, which recounts the events of the first 21 years of the 28 year war between Sparta and Athens in the fifth century B.C.E. (432 - 404 B.C.E.). This is widely considered to be the first work of scientific history, describing the events of the human world as produced by men acting from ordinary motives, without the intervention of the gods or the supernatural. Thucydides wrote critically and objectively, demonstrating considerable ability in analyzing character and in tracing the relationship between cause and effect in the events of history. History of the Peloponnesian War was unfinished and contained some inconsistencies, but it was a dramatic and powerful account. Thucydides reconstructed debates and speeches to show how decisions were made, indicating that he trained under several Sophists. Many of these speeches were based on the premise that people care more about their own narrow interests than about the cause of justice. This pessimistic view of human nature later had an influence on Thomas Hobbes. The style of the debates and speeches has had an enduring effect on the study of rhetoric. Thucydides’ account of Athenian democracy in action was intended to demonstrate its potential weaknesses. Some of his conservative political views anticipated those of Aristotle. The only certain facts about the life of Thucydides are those which he revealed during his own narrative, The History of the Peloponnesian War. He was an Athenian, and when the Peloponnesian War began in 431 B.C.E. he was probably in his twenties, old enough to understand the importance of the war and to begin writing about the events which provoked it. This would mean he was born no later than 460 B.C.E. Thucydides' father was Olorus, a name connected with Thrace and Thracian royalty. His daughter was believed to have been buried in the same area as Creon, a Thracian Prince or King. Thucydides, born in Alimos, was connected through family to the Athenian statesman and general Miltiades, and his son Cimon, leaders of the old aristocracy supplanted by the Radical Democrats. Thucydides lived between his two homes, in Athens and in Thrace. His family connections brought him into contact with the political leaders who were shaping the history he wrote about. Thucydides was in Athens when the great pestilence ravaged the city between 430 and 427 B.C.E., killing Pericles along with thousands of other Athenians.. He caught the disease himself and saw others suffer around him. Thucydides was older than thirty when he was appointed strategos (general) in 424 B.C.E. and given command of a squadron of seven ships, stationed at Thasos, probably because of his connections to the area. During the winter of 424-423 B.C.E., the Spartan general Brasidas attacked Amphipolis, a half-day's sail west from Thasos on the Thracian coast. Eucles, the Athenian commander at Amphipolis, sent to Thucydides for help. Brasidas, aware of Thucydides' presence on Thasos and his influence with the people of Amphipolis and afraid of help arriving by sea, acted quickly to offer moderate terms to the Amphipolitans for their surrender, which they accepted. When Thucydides arrived, Amphipolis was already under Spartan control Amphipolis was of considerable strategic importance, and news of its fall caused great consternation in Athens. Thucydides was exiled from Athens for 20 years because of his failure to save Amphipolis; he used his status as an exile to travel freely among the Peloponnesian allies, viewing the war from the perspective of both sides and conducting important research for his history. It was also my fate to be an exile from my country for twenty years after my command at Amphipolis; and being present with both parties, and more especially with the Peloponnesians by reason of my exile, I had leisure to observe affairs more closely. The remaining evidence for Thucydides' life comes from later, less reliable ancient sources. According to Pausanias, someone named Oenobius was able to get a law passed allowing Thucydides to return to Athens, presumably sometime shortly after Athens' surrender and the end of the war in 404 B.C.E. Pausanias goes on to say that Thucydides was murdered on his way back to Athens. Many doubt this account, seeing evidence to suggest he lived as late as 397 B.C.E. Plutarch claims that his remains were returned to Athens and placed in Cimon's family vault. The abrupt end of his narrative, which breaks off in the middle of the year 411 B.C.E., has traditionally been interpreted as indicating that he died while writing the book, though other explanations have been put forward. Thucydides legacy as a historian is contained in his single known work, History of the Peloponnesian War. (A more accurate title, reflecting the opening sentence of the work, would be "The War Between the Peloponnesians and Athenians.") The work recounts in detail the history of the twenty-seven-year war between Athens and its allies and Sparta and its allies, breaking off near the end of the twenty-first year. Thucydides is generally regarded as one of the first true historians. Unlike his predecessor Herodotus (often called "the father of history"), who included rumors and references to myths and the gods in his writing, Thucydides regarded history as being caused by the choices and actions of human beings. One of Thucydides' major innovations was to the use of a strict standard of chronology, recording events by year, each year consisting of the summer campaigning season and a less active winter season. As a result, events that span several years are divided up and described in parts of the book that are sometimes quite distant from one another, causing the impression that he is oscillating between the various theaters of conflict. This method contrasts sharply with Herodotus' earlier work The Histories, which moves around chronologically and frequently digresses into accounts of seemingly unrelated areas and time periods. Despite being an Athenian and a participant in the conflict, Thucydides tried to present a generally unbiased account of the conflict and all the sides involved in it. In his introduction he states, "My work is not a piece of writing designed to meet the taste of an immediate public, but was done to last for ever" (1.22.4). His unconscious biases are evident; for example, from a modern viewpoint he seems to underestimate the importance of Persian intervention. However, Thucydides was the first historian who seems to have attempted complete objectivity. Through his examination of historic causation, he created the first scientific approach to history. The whole earth is the sepulchre of famous men; they are honored not only by columns and inscriptions in their own land, but in foreign nations on memorials graven not on stone but in the hearts and minds of men. Though many lay unburied, birds and beasts would not touch them, or died after tasting them. … The bodies of dying men lay one upon another, and half-dead creatures reeled about the streets and gathered round all the fountains in their longing for water. The sacred places also in which they had quartered themselves were full of corpses of persons that had died there, just as they were; for as the disaster passed all bounds, men, not knowing what was to become of them, became utterly careless of everything, whether sacred or profane. All the burial rites before in use were entirely upset, and they buried the bodies as best they could. Many from want of the proper appliances, through so many of their friends having died already, had recourse to the most shameless sepultures: sometimes getting the start of those who had raised a pile, they threw their own dead body upon the stranger's pyre and ignited it; sometimes they tossed the corpse which they were carrying on the top of another that was burning, and so went off. Thucydides assiduously consulted written documents and interviewed participants in the events that he records, but he almost never names his sources, cites conflicting accounts of events only a few times. He appears to be striving for a seamless narrative. Scholars who have tried to deduce his sources have noted that, after his exile from Athens, his accounts of events in Peloponnesia become more numerous, indicating that he had increased access to sources there. Thucydides appeared to assert knowledge of the thoughts of certain individuals at key moments in his narrative, indicating that he must have interviewed these people afterwards. However, after the Sicilian Expedition he related the thoughts of generals who had died in the battle and could not have been interviewed, implying that he took the liberty of inferring peoples’ thoughts and motives from their actions and from what he thought might have been likely in such a situation. The rhetorical character of his narrative indicates that Thucydides was at least familiar with the teachings of the Sophists, traveling lecturers, who frequented Athens and other Greek cities. It has also been suggested that Thucydides' strict focus on cause and effect, his fastidious attention to observable phenomena to the exclusion of other factors, and his austere prose style show the influences of the methods and thinking of early medical writers such as Hippocrates of Kos. Some scholars have maintained that Thucydides had some medical training. Occasionally throughout "The History of the Peloponnesian War" Thucydides displays a sardonic sense of humor, such as in his description of the Athenian plague (Book II), when he remarks that some old Athenians seemed to remember a rhyme that said with the Dorian War would come a "great death." Some claimed the rhyme was actually about a "great dearth" (limos), and was only remembered as "death" (loimos) due to the current plague. Thucydides then remarked that, should another Dorian War come, this time attended with a great dearth, the rhyme would be remembered as "dearth," and any mention of "death" forgotten. Thucydides admired Pericles and approved of his power over the people, though he detested the pandering demagogues who followed him. Thucydides did not approve of the radical democracy ushered in by Pericles, but thought that it was acceptable when in the hands of a good leader. Although Thucydides has sometimes been misrepresented as a cold chronicler of events, strong passions occasionally break through in his writing, for example in his scathing appraisals of demagogues such as Cleon and Hyperbolus. Thucydides was clearly moved by the suffering inherent in war, and concerned about the excesses to which human nature is apt to resort in such circumstances. For example, in his analysis of the atrocities committed during civil conflict on Corcyra in Book 3, Chapters 82-83, he includes the memorable phrase "War is a violent teacher." The division of The History of the Peloponnesian War into eight books was probably not Thucydide’s original intention, but was accomplished by later ancient editors. The account stops abruptly during the events of the autumn of 411 B.C.E., more than six and a half years before the end of the war. The first book of the History, after a brief review of early Greek history and some programmatic historiographical commentary, seeks to explain why the Peloponnesian War broke out when it did and what its causes were. Except for a few short digressions (notably 6.54-58 on the Tyrant Slayers), the remainder of the History (books 2 through 8) rigidly maintains its focus on the Peloponnesian War to the exclusion of other topics. While the History concentrates on the military aspects of the Peloponnesian War, it uses these events as a medium to suggest several other themes closely related to the war. Several passages discuss the socially and culturally degenerative effects of war on humanity. The History is especially concerned with the lawlessness and atrocities committed by Greek citizens on each other in the name of one side or another in the war. Some events depicted in the History, such as the Melian dialogue, describe early instances of power politics. The History is preoccupied with the interplay of justice and power in political and military decision-making. Thucydides' presentation is decidedly ambivalent on this theme. While the History seems to suggest that considerations of justice are artificial and necessarily capitulate to power, it sometimes also shows a significant degree of empathy with those who suffer from the exigencies of the war. In addition to examining the political causes of the war, Thucydides was interested in the conflict between the national characters of the active, revolutionary, innovative Athenians and the slower-moving, more cautious Peloponnesians. He described the Spartans as, “not excited by success nor despairing in misfortune,” but quietly self-confident. He also appreciated the significance of the personalities of various leaders. Through their words and deeds he depicted the characters of the men who influenced events, such as Cleon, the harsh demagogue of Athens; Hermocrates, the would-be moderate leader in Syracuse; the brave Nicostratus; and the incompetent Alcidas. He particularly concentrated on the characters and the political influence of four active men: Themistocles (featured in a digression as the Athenian hero of the Second Persian War), Pericles, Brasidas, and Alcibiades. He especially admired Pericles of Athens, who combined a daring imagination and intellect with caution, moderation, and stability. Each of these four men faced opposition from a conservative faction within his own country. Thucydides did not live to write about the end of the Peloponnesian War, which saw the stolid and stable Spartans triumph over the volatile and intellectually brilliant Athenians. Thucydides was keenly interested in the technical aspects of warfare. The Peloponnesian War was a conflict between the powerful land force of Sparta and its allies and the powerful naval force of Athens. One of the greatest challenges was the protection of food supplies during battles on land. Thucydides studied the details of siege warfare; the challenges facing an army an army trying to force a landing from ships against troops on shore; and the difficulties of the heavily armed combat in mountain country and of fighting against the fierce but disorganized barbarians of the north. He describes the great night battle at Syracuse; the skill of the Athenian sailors and the way their daring maneuvers were overcome by the Syracusans; and the unexpected recovery of the Athenian fleet after the Sicilian disaster. Thucydides’ introduction on the early history of Greece emphasizes the development of maritime trade and naval power and the accumulation of resources by both sides, setting the stage for the great war between the two powers. Thucydides' History has had an influence on both ancient and modern historiography. It was embraced by the author's contemporaries and immediate successors with enthusiasm; many authors sought to complete the unfinished history. Three historians, Cratippus (a younger contemporary), Xenophon (who lived a generation later), and Theopompus (who lived in the last third of the fourth century), all began their histories of Greece where Thucydides left off. Xenophon’s Hellenica begins at the exact moment that Thucydides' History leaves off. 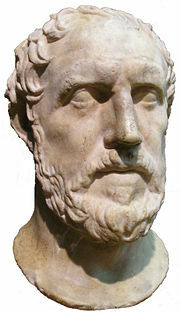 In later antiquity, Thucydides' reputation suffered somewhat, with critics such as Dionysius of Halicarnassus rejecting the History as turgid and excessively austere. Lucian of Samosata also parodies it (among others) in his satire The True Histories. The view that people care more about their own narrow interests than about the cause of justice later had an influence on the ideas of Thomas Hobbes, who published a translation of History in 1628. The style of the debates and speeches has had an enduring effect on the study of rhetoric. Thucydides' History is extraordinarily dense and complex, resulting in considerable scholarly debate over its interpretation. It is virtually certain that Thucydides died while still working on the History, since it ends in mid-sentence and ends in 410 B.C.E., leaving six years of war uncovered. It is uncertain whether he intended to revise the sections he had already written. Some apparent contradictions between certain passages in the History have been explained by the proposal that they were written at different times and that Thucydides' opinion on the conflicting matter had changed. Those who argue that the History can be divided into various levels of composition are usually called "analysts" and those who argue that the passages must be made to reconcile with one another are called "unitarians." This conflict is called the "strata of composition" debate. Classical scholar Jacqueline de Romilly first pointed out, just after World War II, that one of Thucydides' central themes was the ethic of Athenian imperialism. She analyzed his History in the context of Greek thought on the topic of international politics. Since her fundamental study, many scholars have studied the theme of power politics, realpolitik, in Thucydides' history. Other authors, including Richard Ned Lebow, reject the common perception of Thucydides as a historian of naked real-politik. They argue that the History was written as a warning to political leaders and an exposure of the moral decay of Athens, which had ceased to be the shining city on the hill described by Pericles in the Funeral Oration and had become a power-mad tyrant over other cities. Leo Strauss, in his classic study The City and Man,  argued that Thucydides had a deeply ambivalent understanding of Athenian democracy: on the one hand, "his wisdom was made possible" by the Periclean democracy, which allowed him the freedom to question and to express his opinions; but this same freedom allowed unrestricted political ambition and thus imperialism, and eventually led to civic strife. More conventional scholars view him as recognizing and teaching that democracies require good leadership, and portraying the dangers of democracy under bad leadership. ↑ Thucy_4.104.4  Perseus, Tufts University. Retrieved June 23, 2008. ↑ Herod_6.39.1 .Perseus. Tufts University. Retrieved June 23, 2008. ↑ Donald Kagan, "The Speeches in Thucydides and the Mytilene Debate," Yale Classical Studies (1975) 24:71-94. ↑ "The Melian Dialogue" (Book 5, Chapter 17). Translated by Richard Crawley. .Internet Classics. Retrieved July 15, 2008. Thomas Hobbes, 1628: full text.libertyfund.org. Retrieved June 23, 2008. Richard Crawley, 1874: full textProject Gutenberg. Retrieved June 23, 2008. Benjamin Jowett, 1881: full text.Classicpersuasion.org. Retrieved June 23, 2008. Herodotus; Godley, A. D. (translator), The Histories of Herodotus. Cambridge, MA: Harvard University Press, 1920. ISBN 0674991338 . Pausanias. Description of Greece, Books I-II, (Loeb Classical Library) translated by W. H. S. Jones; Cambridge, MA: Harvard University Press; London, William Heinemann Ltd., 1918. ISBN 0674991044. .
Plutarch, Parallel Lives, Bernadotte Perrin (translator), Cambridge, MA: Harvard University Press. London. William Heinemann Ltd., 1914. ISBN 0674990536 . Thucydides. The Peloponnesian War. London: J. M. Dent; New York: E. P. Dutton, 1910. .
Connor, W. Robert. Thucydides. Princeton: Princeton University Press, 1984. ISBN 0691035695. Hanson, Victor Davis. A War Like No Other: How the Athenians and Spartans Fought the Peloponnesian War. New York: Random House, 2005. ISBN 1400060958. Hornblower, Simon. A Commentary on Thucydides. 2 vols. Oxford: Clarendon, 1991-1996. ISBN 0198150997 (vol. 1), ISBN 0199276250 (vol. 2). Hornblower, Simon. Thucydides. London: Duckworth, 1987. ISBN 0715621564. Luce, T.J. The Greek Historians. London: Routledge, 1997. ISBN 0415105935. Orwin, Clifford. The Humanity of Thucydides. Princeton: Princeton University Press, 1994.
de Romilly, Jacqueline. Thucydides and Athenian Imperialism. Oxford: Basil Blackwell, 1963. ISBN 0881430722. Rood, Tim. Thucydides: Narrative and Explanation. Oxford: Oxford University Press, 1998. ISBN 0199275858. Strassler, Robert B., ed. The Landmark Thucydides: A Comprehensive Guide to the Peloponnesian War. New York: Free Press, 1996. ISBN 0684828154. This page was last modified on 7 December 2015, at 23:01.